One of my favorite TV shows is Futurama. It’s a weird, stupid cartoon in which a slacker named Fry is cryogenically frozen in the year 2000 only to be unfrozen a thousand years later. He awakes to find that one eyed (and curvy) female aliens and beer drinking robots are part of normal every day life. In one episode Fry, his distant relative, a mad scientist named Professor Farnsworth (just go with it) and the beer drinking, fire belching robot go back in time. Like all TV shows, the plot and setting completely reset by the end of the half hour run time with the exception that the professor stopped briefly in the year 1939 so that he can assassinate Hitler with a massive ray gun. Isolated and surrounded by a forest hundreds and in some cases thousands of years old, the land here can feel as if it’s been frozen like Fry and we’re able to glance back in time by simply walking through the forest and counting the rings on fallen trees. But it’s not static. Nothing is. There is no climax community where, if left undisturbed it will stand immaculate forever. I often find myself obsessed with how the land and wildlife looked thirty years ago, a hundred years ago, a millennium, an epoch ago. So I scour the books and testimonies of those that have come before me. Offhand comments like one by Paul a couple months ago send my imagination into overdrive. No way. I stare up at the cliffs that form the southern border of Parson Island and try to imagine it dotted with buildings. The absurd image of a 30 story Hilton plays before my mind. Communities in Freshwater Bay, fish buying companies in every cove, hand loggers determinedly probing through the inlets looking for something bigger. One of these men was Billy Procter. He’s something of a legend. Our Gandolf or Obi-Wan Kenobi if you’d prefer. He grew up in Freshwater Bay, a little indention in Swanson Island a five minute boat ride from where Orca Lab now sits. Of course in the 1920s there was no Orca Lab. No whale watching industry, Orca’s nothing more than competition for fish. For it was fish that pumped the blood of the north island and Billy talks endlessly of massive runs of salmon. So thick on the flooding tide that the air was inundated with their odor. “The Blackfish used to follow them through Blackfish Sound in numbers so thick you could walk across there backs,” he relayed to Alexandra Morton. It’s these phrases that make me yearn for a different time. “The good old days” as it were. When a 2 HP engine was nothing short of a miracle, and fishing was as easy as dropping a line in the water and jigging for a few minutes. Before clear cuts and climate change, before fishing stocks plummeted or tugs chugged in an endless relay up and down the strait. “I was born too late,” I think, setting down Billy and Alex’s book, Heart of the Raincoast. I want to see that sort of abundance. I want to fish, can, and gather my way to an existence. I want to live in a float house and tow it up and down Knight Inlet. 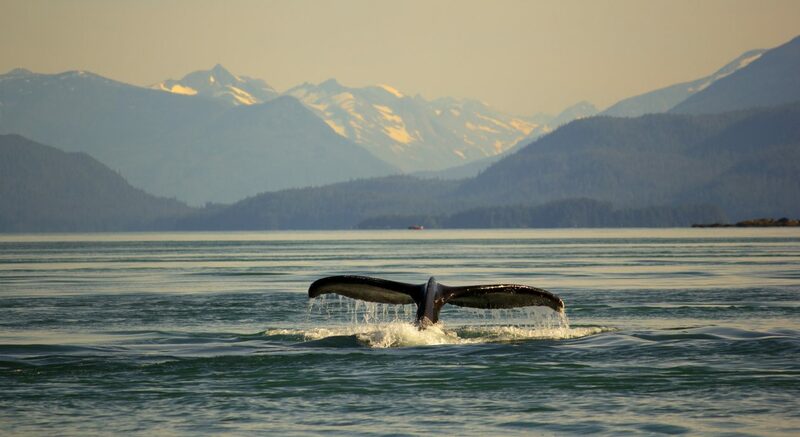 In the 70’s Erich Hoyt and two other filmmakers sailed up Johnstone Strait and settled in Robson Bight, spending the summer tracing the loving shorelines of Cracroft, Vancouver, and Hanson, following the whales. No rules, no regulations, no cares. I was born too late. They were camping in the bight, documenting the rubbing beaches for the first time. Rubbing shoulders with the parade of scientists who rewrote the book on the “savage killer whale” and helped us see them the way we do. I want to dive off the rubbing beaches, follow an orca pod in my kayak with no boats blitzing past me at 30 knots. I want to ride the ebb out Blackfish and the flood through Weynton. I want the good old days. I want to steal Futurama’s time machine and sit on the rocks at the feet of an old growth forest that has never been cut. I’ll even agree to take out Hitler on my way. Because no one talks about the “bad old days.” No one dwells on the fact that everything that ate fish had a bounty on it sixty years ago. 2 bucks for a seal’s flippers, a dollar for a Raven’s beak or an eagle’s talons. That there’s a reason that the salmon don’t run so thick you can smell them followed by Blackfish that form a bridge across the sound. That the slow curve downward began somewhere. Or that the 70’s were filled with the live capture trade for Orca’s and the cold blooded murder of several others. That there’s a reason that the beaches and bight are closed, that the minimum distance is 100 meters. That today we live with the decisions made during those days that were neither good nor old. So I go to ask the one soul on this island that’s lived in it for a millennium. I walk to Grandma Cedar whose cedar boughs have seen it all. Has watched the salmon come and go, the glacier’s charge and retreat, and a lab be built at her feet. Does she miss the good old days? The bad old days? I stare up at her, my neck craning, trying to make out the branches that originate a hundred feet above me. But she is centered in the here and now. Focused on the simple task of taking the miracle of sunlight and carbon dioxide and turning it into oxygen. Perhaps if all she’s thinking about is today I should be too. Maybe it’s one thing to read and admire history and another to yearn for a world I know virtually nothing about. One thing to devour old black and white photos and dig for artifacts on the shoreline and another to feel as if it will never be that good again. To let go of a history I can’t even begin to understand or control, and look to a future I can. You can keep your time machine Professor. Cover photo credit: BC Archives. Freshwater Bay C.A 1916.